Posted bySEOHolicc	 April 22, 2008 Leave a comment on Celebrate Earth Day, Search Community! I figured that Earth Day would have received much more acknowledgment around the web, but not so much from the big search engines. Ask.com changed their homepage, as well as Google of course, which you can see below. The same goes for YouTube (above), but what about everyone else? Nothing from Yahoo, Reddit, Digg, MSN Search, Live.com, or Facebook. I would love to see more big names trying to help out. I’m very surprised about this actually. Especially from Yahoo. I was almost certain I’d see a logo change or something when I visited the site. Myspace is the clear winner today though. 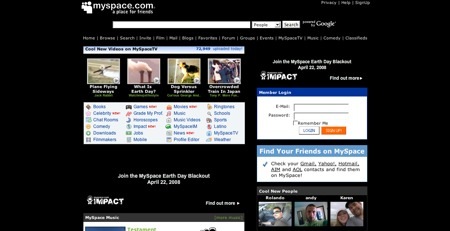 The Myspace page has been blacked out and links to a very “Green” web page you should check out. If you go there, you’ll notice that there is a great incentive in which if you plant a tree on your Myspace profile, a tree will be planted in real life. Now if only all the big names of the internet would get the word out, we could be living in a much cleaner and healthier place.